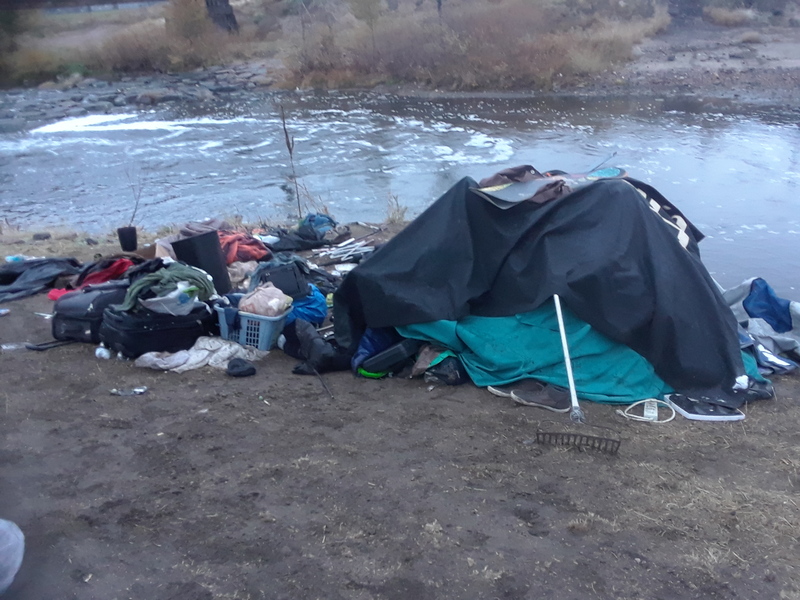 Today, November 7 2017, Denver Park Ranger took a homeless man named Jackson’s tent, sleeping bag, and blankets and left his other possessions and trash from inside the tent strewn about. This was done on a day when it is 25 degrees and snowing. Jackson has been surviving on the river in this spot for months. Two friends were present with his stuff when the park ranger came and took Jackson’s property. These friends informed the park ranger they were there watching his stuff and the park ranger took it regardless. This is all taking place as the class action lawsuit against the city of Denver for the homeless sweeps is in progress before the federal district court. The constitutional rights founding this law suit – 4th amendment to property and 14th amendment rights to due process of law – continue to be violated by the city of Denver every day. Read Jackson’s open letter to Ranger Eric demanding his property be returned below. Winter is here and the city is taking homeless people’s survival gear on freezing snowing days putting people’s lives at sever risk. This MUST END. I want all my property returned. I am contacting the Denver Police regarding harassment and theft based on your selective behavior, and abuse of authority against the people left to protect my property and kittens. What possible reason could you have to take only my personal property mostly limited to blankets, sleeping bag and tent and tarps, that was also protecting the four 2 week old kittens that you know I was attending to. I left people to watch over my property. Alex and Mike tell me that they all attempted to prevent you from taking the things and to return them all yet you refused. You took only the things that I need to survive the sub freezing temperatures of last night and the next few nights at sub freezing and wet. Though I may be younger than you Eric, I am 51, and my 2 sons would be very distressed if I freeze to death or end up with frostbite. And I am going to be very upset if the 4 newborn kittens are harmed because of this, I had intentions of adopting them out to quality households when they are able to leave their mother, who adopted me not vise versa. This is in my opinion against the law, sneaky, and very disheartening, that I had left property guards while attending to business in town this morning. Your behavior seems targeted considering all the other tents and property on the S Platte. I would like my property returned so I can continue to pack and store it as was done all day yesterday and the day before. Leaving 60% of the items that were inside the tent sprawled all over the Riverfront Denver Ranger takes homeless man’s tent, sleeping bag and blankets leaving trash everywhere! while only taking the survival gear is ludicrous! Yes it will make for good video and chapters in the new book but that is not a factor in the 25 degree temps.